Few people living here before the lake existed could envision how dramatically the Smith Mountain Pumped Storage Project would transform this part of the Roanoke River Valley. What was once farmland, fields, and rocky gorges has become a picturesque, 40-mile long lake, covering 22,000 acres, with 500 miles of shoreline. At one time, the only expected economic impact from the dam was electricity generation. Today, Smith Mountain Lake, besides being a source of electricity and drinking water, is a prime recreational resource for fishermen and vacationers and home to a thriving lakeside community consisting of as many as 21,000 residents. Long before Columbus journeyed to the Americas, Native Americans lived and traded in the Roanoke Valley. Tutelo, Monacan, Iroquois, Cherokee, and Shawnee were drawn to the valley by abundant game that gathered at several large salt licks found in the area. According to Smithsonian Institute archeologists, about 35 Native American camps once lined the banks of the Roanoke and Blackwater Rivers in the area now covered by the lake. Relics found prior to the flooding indicate that these camps predate Columbus by as many as 500 years. Still other evidence indicates that early man lived here more than 7,000 years ago. Below are the known historical dates in the Lake's history. 1670. John Lederer, a German physician, is the earliest recorded white settler to enter the area, near present-day Altavista. 1671. Abraham Woods would lead a party of settlers through the Smith Mountain Gap. 1730s. Modification of Virginia's Land Laws causes an influx of settlers to the Roanoke-Staunton area. Two brothers, Daniel and Gideon Smith, arrive in 1740 and take ownership of the mountain that now bears their name. 1840s. The area is largely settled; in the decades that follow, the region sees little development and remains a sparsely populated rural community. Up until the 1960s, farmers live a quiet, rural life, raising dairy cattle and growing tobacco, wheat, corn, tomatoes and other crops. 1924. The Roanoke-Staunton River Power Company forms and kicks off plans to build a dam in the gap at Smith Mountain. The company purchases 1,500 acres in Bedford County and 4,000 acres in Pittsylvania County. 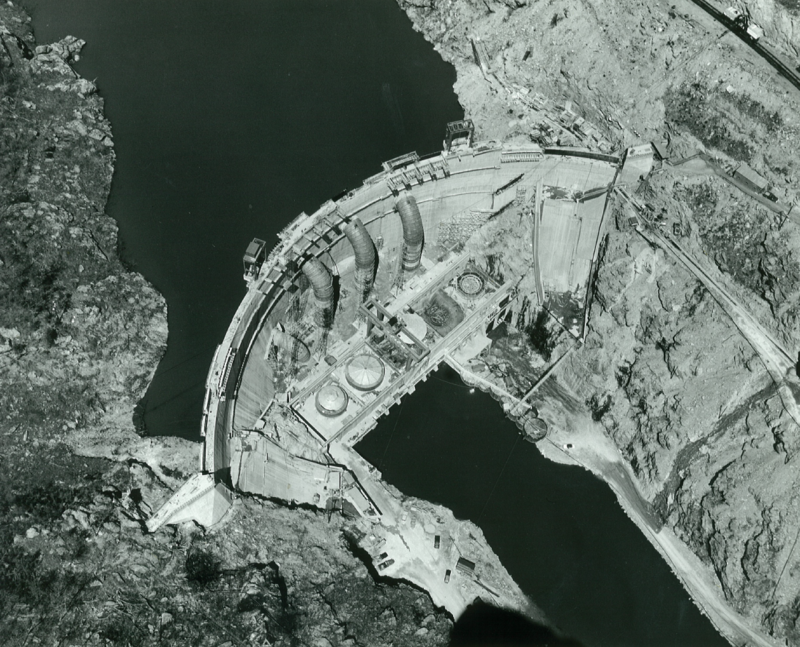 Studies undertaken in the 1920s and 1930s conclude that construction of the dam is not economically feasible. 1934 and 1944. Congress twice refuses to fund the dam project despite a study by the U.S. Army Corps of Engineers (USACE) that recommends Smith Mountain as one of eleven flood-control projects that should be built on the Roanoke River and its tributaries. 1949. Appalachian Power (APCO) testifies before a congressional committee that it will undertake the project when and if it is economically feasible. 1950. The USACE holds a public hearing on the dam project in Moneta, Virginia, on January 28, 1950. During this hearing, citizens complain about government competition with private enterprise. Railway and coal representatives allege that the project is a threat to their economic wellbeing. They argue that hydro-electric development would have drastic negative effects on the consumption of coal, which is hauled by rail. Additionally, one speaker argues that the flooding of land would result in a substantial tax loss. Of those present at the hearing, 130 vote in favor of the project; 115, against. On the basis of that ballot and the positive USACE economic feasibility finding, the Roanoke River Basin Association decides to seek funding for the dam from Congress. Shortly thereafter, APCO announces that it will apply for a permit to build the dam without government funds. 1954. APCO purchases the lands and rights for the Smith Mountain Dam from the Roanoke-Staunton River Power Company, which had liquidated. 1956. APCO files a preliminary permit with the Federal Power Commission (FPC) to build a 60-megawatt (MW), 200-ft.-high dam. During the design phase, studies are completed that determine the pumped storage project should consist of two dams, two powerhouses, and two reservoirs. The capacities would be much larger than originally planned – 400 MW at Smith Mountain and 40 MW at Leesville Lake. 1960. 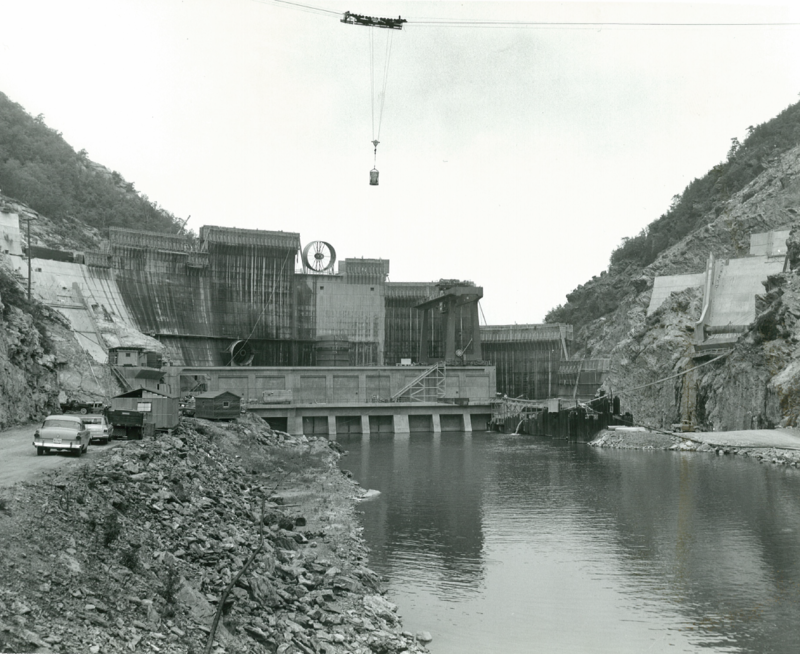 The FPC approves the license for APCO to construct its hydro-electric dam project on April 26, 1960, clearing the way for the major work to begin. Construction of the dam commences later that summer. During construction, peak employment reaches 400. Dr. Jeffrey Fong, chief designer of the Smith Mountain Dam, then only 25 years old, faces the daunting design task at a time when there are no calculators or computer-aided drawing programs. All drawings are done by hand, in pencil. All calculations are done using slide rules; a team of 10 engineers works on the calculations. The first task is to string a 1,500-foot cable between the mountain gap, 325 feet above the riverbed, to haul material, men, and bulldozers back and forth. The cable carries an estimated half million tons of building materials by the time construction is complete. One of the most important phases of the huge project, especially to the scores of families who lived here for generations, is the grave removal program. Two APCO officials, Herbert Taylor and Curtis Roberts, spend three years combing 50,000 acres of dam project land for graves that need to be moved to higher ground. They relocate a total of 1,354 graves that are in the flood area. 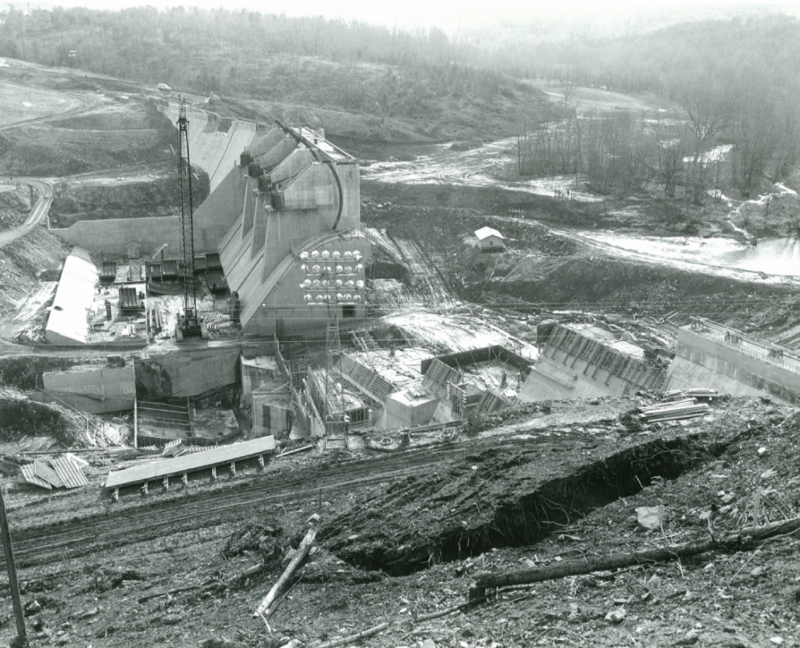 Another massive job – the clearing of timber, brush, and debris – is completed in March 1963. It takes six years and a crew of 200 to move 300,000 cubic yards of mountain forest to make way for the 175,000 cubic feet of concrete used to build the dam. Additionally, trees in the Smith Mountain Reservoir are topped to elevation 782, five feet below the understood minimum generating pool elevation of 787 feet above sea level. The tree topping project is finished by 1965. Construction of the dam brings major changes to the rural farming communities that had existed here for generations. Many farmers sell their property and move. Numerous old tobacco barns, livestock pens, and outdoor buildings are torn down or burned. One of the affected farmers is James R. Saunders, who had been in the lumber and cattle business. When the water forms beautiful coves and a scenic shoreline around his home, Saunders builds a marina in 1966, which still operates today. The DeLong family, which runs a general store near the old Hales Ford Bridge, has to open a new store on higher ground. The old store is now underwater. With the rising waters come escalating prices on waterfront lots. In April 1965, the average lot price is $1,750-$3,500, a far cry from today’s typical price of $250,000 or more. Fishing is the big attraction and draws hundreds of anglers to the lake to fish at Saunders Marina, Hales Ford Bridge, and Hardy Bridge. Several marinas and campgrounds quickly spring up as entrepreneurs seize the opportunity to service crowds of fishermen. The first camping area, Eagles Roost, opens in May 1965, serving fishermen with tent sites. It still operates today. At 5:03 a.m. on March 7, 1966, the lake reaches 795 feet above sea level (full pond) for the first time. The giant project, which began in 1960, is complete. The water depth at the dam is recorded as 200 feet on that day. Generators at the dam have been making electricity for several weeks. The total project cost, including Smith Mountain and Leesville Lake Dams, hits $66 million. 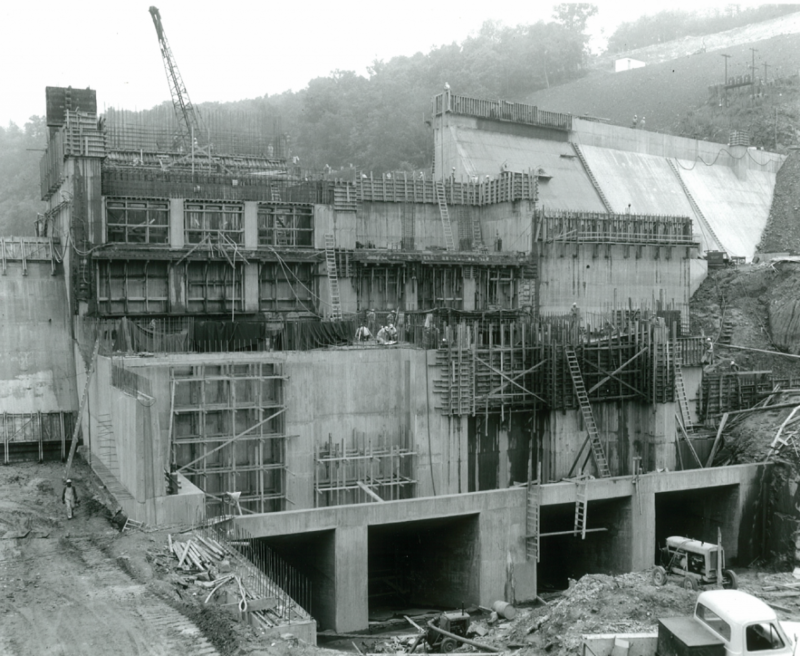 In addition to the dams, APCO also constructs six new bridges and 22 miles of new or improved roads during 1961-1962. The current Hales Ford Bridge is the fourth to span the water there. The first, a toll bridge, washed away in an 1877 flood. A covered bridge is erected in 1879, followed by a steel bridge, constructed downstream, in 1940. It is now underwater, having been left in place when APCO constructs the current bridge. Near the end of November 1962, long-time resident William (“Jap”) Hundley and his mule, Jack, were the first to cross the new, 140-foot high, 1,000-foot long bridge. APCO donates four parcels of land (256 acres in Bedford County and 165 in Franklin County) for creation of the Smith Mountain Lake State Park; additional land is purchased by the state in 1967. APCO donates 100 acres in Franklin County to the West Central 4-H District and makes land available for nine boat ramps at Smith Mountain and Leesville Lakes. By 1967, Smith Mountain Lake, the largest inland water recreation area wholly located in Virginia, has already become a nationally-known hot spot for fishermen and a paradise for campers, boaters, and water-skiing enthusiasts. In 2016, the SML Chamber of Commerce led a community-wide celebration of the Lake's 50 Year Anniversary. The success of the year-long celebration hinged on the participation of dozens of community organizations, clubs and businesses that organized and sponsored events and activities. A wide variety of events were held including a 50K race at the dam, a 50K Around the Lake Yacht Race, a Guinness World Record Attempt, a family-friendly Cardboard Boat Regatta held at the W.E. Skelton 4-H Educational Conference Center, educational lectures on various aspects of the Lake's history, a 60's Weekend featuring the New Crusty Minstrels, a Wings, Wheels and Quilts Show, and the Roanoke Symphony Orchestra presented by the Smith Mountain Arts Council, to name a few. We even had our very own theme song, "The Jewel of the Blue Ridge" by Jerry Hale. 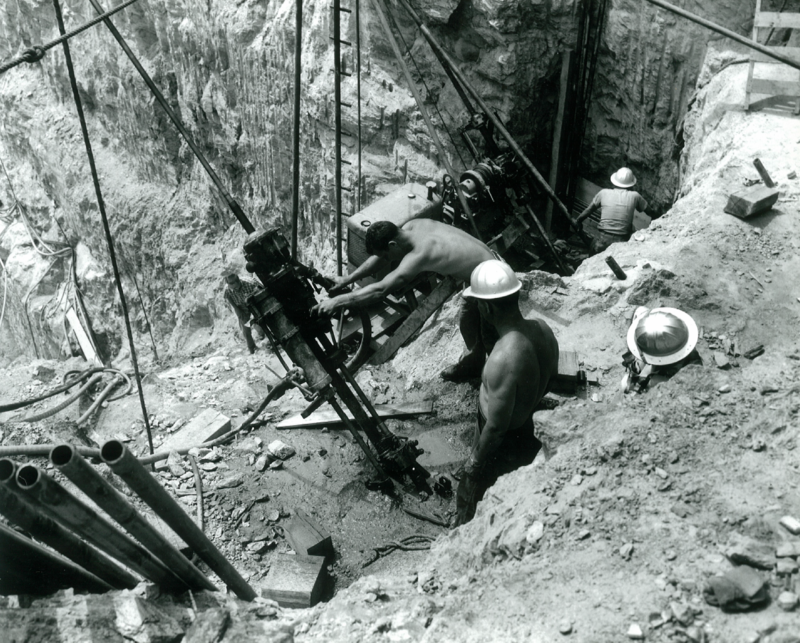 With the financial support of Appalachian Power Co., Blue Ridge PBS produced an hour-long documentary on the history of SML, which debuted at Westlake Cinema with a Red Carpet Event. A Time Capsule was installed at the SML Dam Visitor Center, to be opened in 25 years - Mar. 7, 2041. It truly was an unparalled year! Article provided by Barb Nocera. 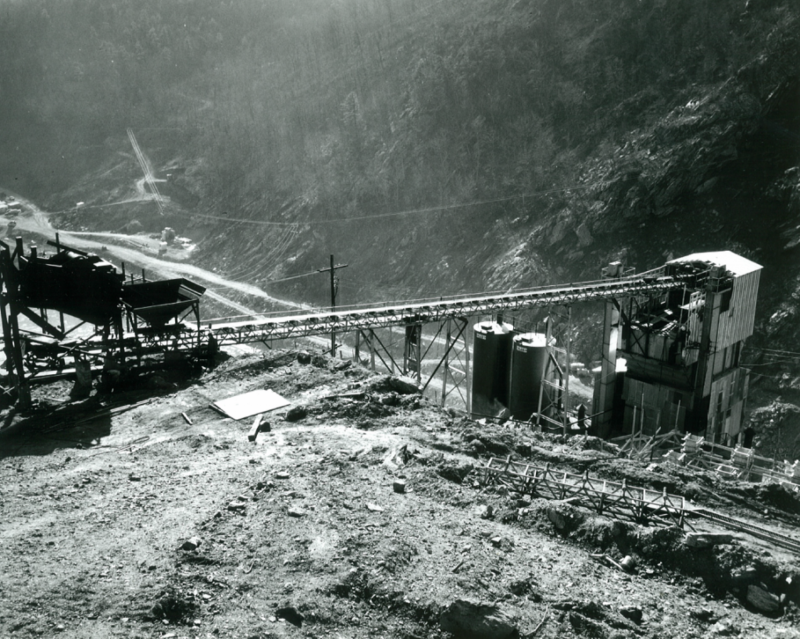 Historical photos below provided courtesy of Appalachian Power Co.